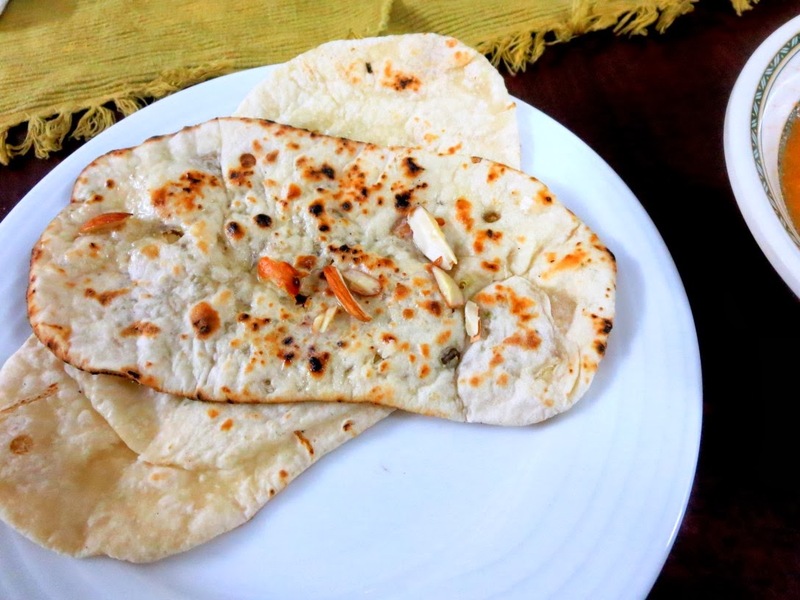 We are starting the BM#38 and I start off with a favourite food of mine, the Naans! We go a long way back and ever since I have been introduced to this, it has reminded my favourite. This and Paneer Butter Masala. This is what I always order when I eat out. 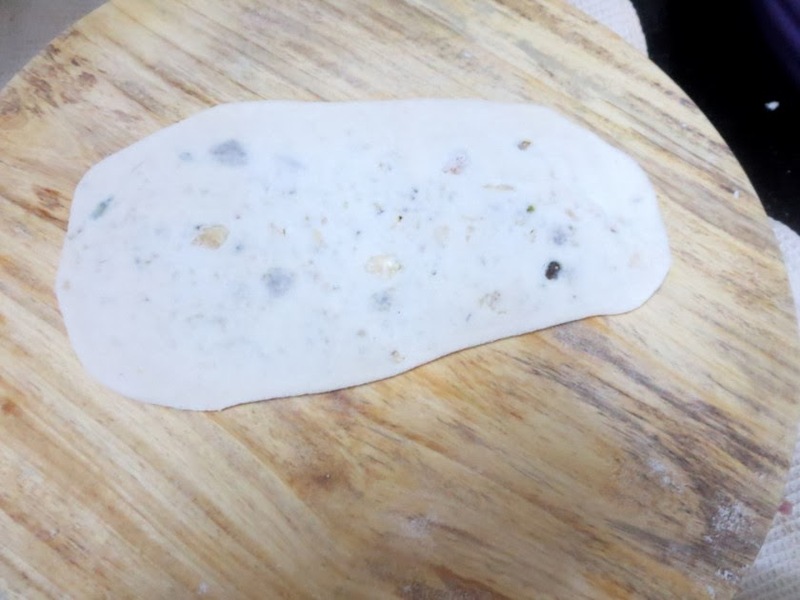 The pizza dough and the Naan dough are almost the same. I recently read a joke that said, Pizzas are foreign returned Naans! Anyway you could use the same dough to make both the dishes. As with pizzas, Naans were my first experiment I did during college. With no Tandoori oven at home, I did best what I could do, I tried my hands in getting the same effect by cooking it under a Pressure cooker etc. I have some versions of Naans already, Tawa Naan, Stove top naans, Fried Naan etc. The PC way of cooking the Naan is quite cumbersome of course, so the simpler method I ended up using is grilling it directly over the flame. This is much quicker, and brings out the same effect. 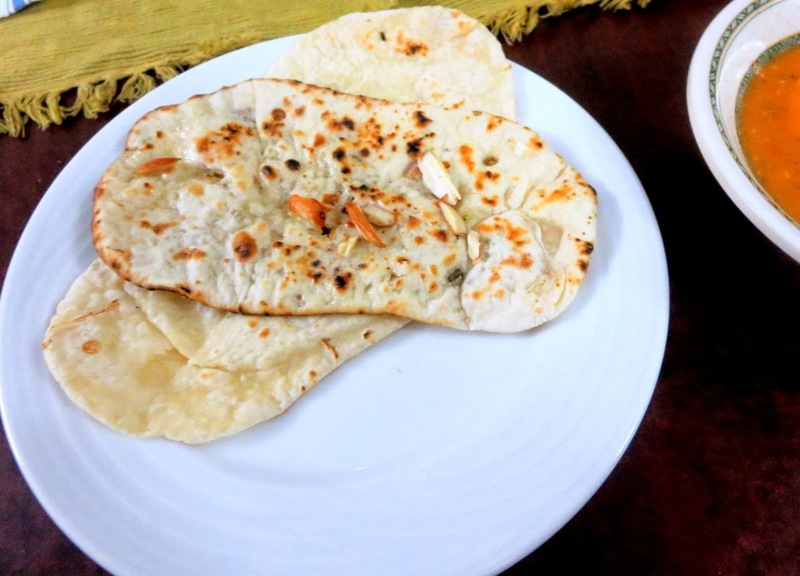 Before going into the recipes, I wanted to talk about how Naan, Kulcha and Roti differ. 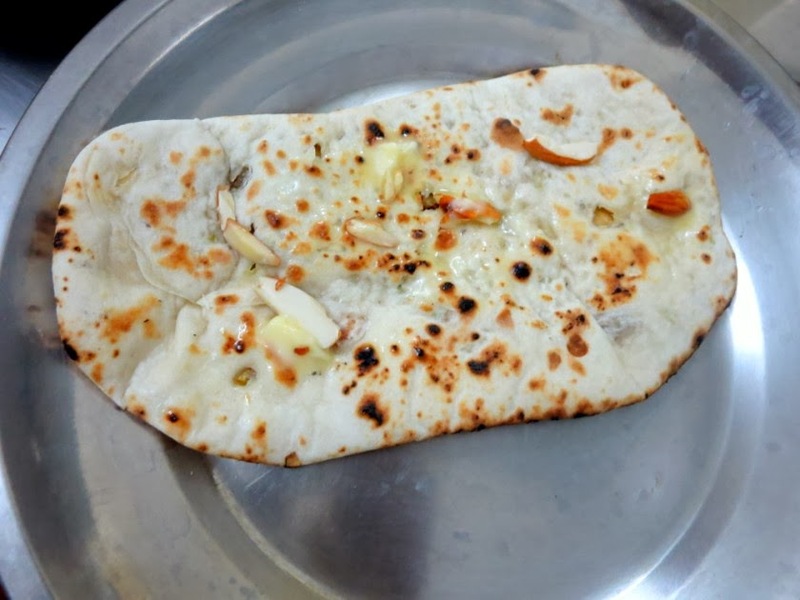 I was reading some of the old articles that talked about how Naans were made many years ago, they mentioned that it was made with wheat flour, leavened with yeast and baked in a Tandoor Oven. 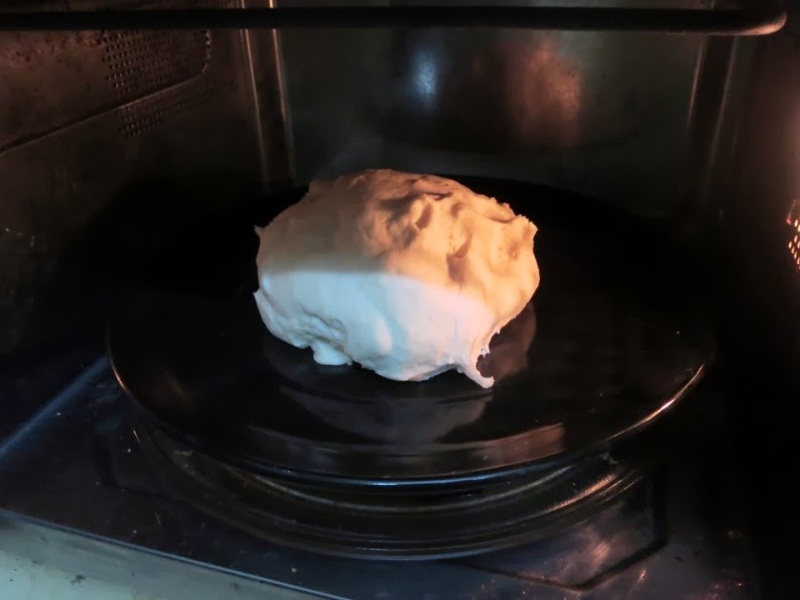 Kulchas on the other hand were all purpose flour dough, leavened with Yogurt and Baking powder. And these again can be baked in a tandoori or regular method. Over the years, it has progressed to such difference that even Naans ended up being made with all purpose flour, with yeast. However the major difference continues to be that Naans are leavened Yeast Bread while Kulchas are leavened with Curds and Baking powder. So if somebody says make Naans without yeast, it is just kulcha for you! 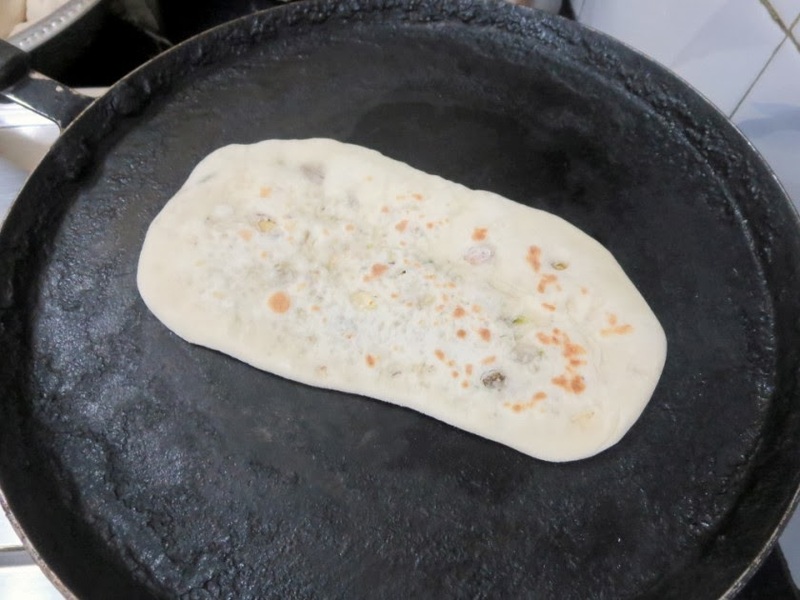 The same Kulcha dough, where you use Curds, baking powder and roll out small as pooris and deep fry, they become Baturas. 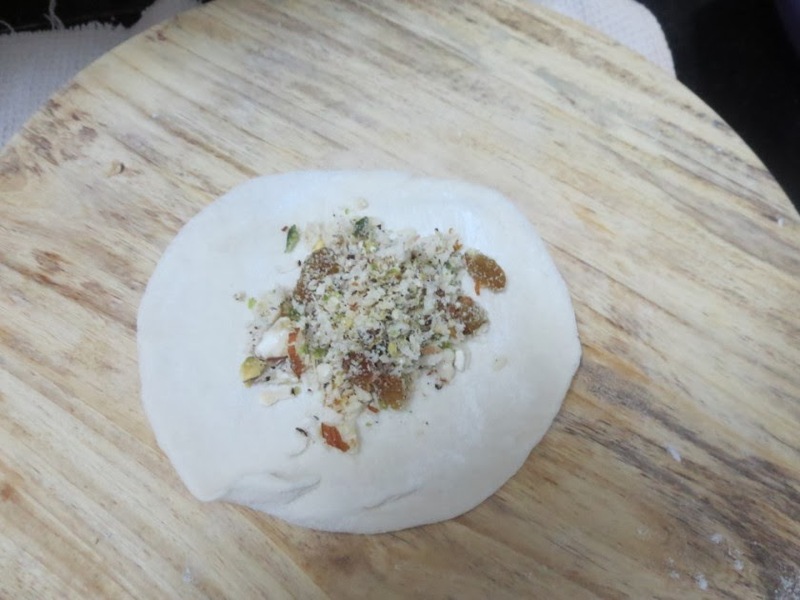 The same Wheat flour dough used before for Naans, when deep fried becomes Khameeri Roti. 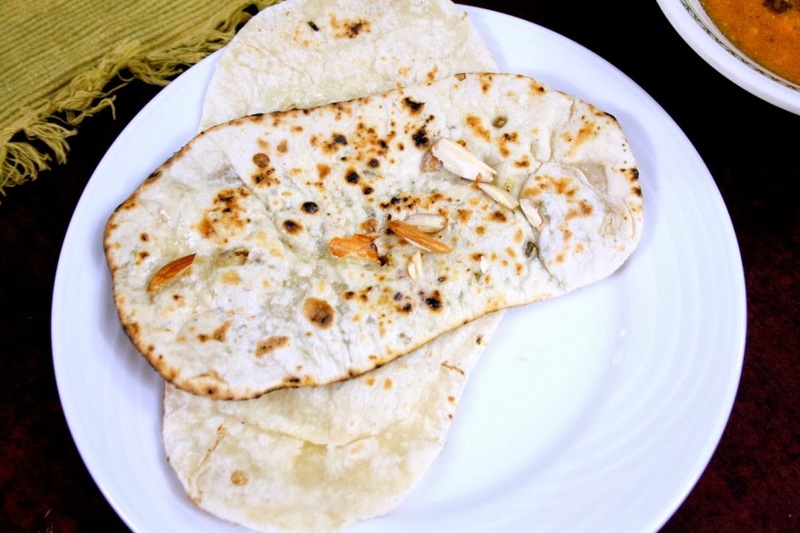 However with the current trend, Khameeri Roti is no longer deep fried, it is again cooked in tandoor or oven. In the end, it all boils down to the fact, we enjoy our flatbreads in as many forms as we like. There is no single guide that says you got to stick to only one form. I will have greater pleasure in discussing this shortly, which is a surprise. I just documented this for the academic in me, and nothing else. When the amount of research that has gone in for the BM#39, I ended up realizing, the same food is called in different names and forms. Ultimately it is the same. I can't even begin to quote one dish that is different. It is as common as Pakodas being served all over India! 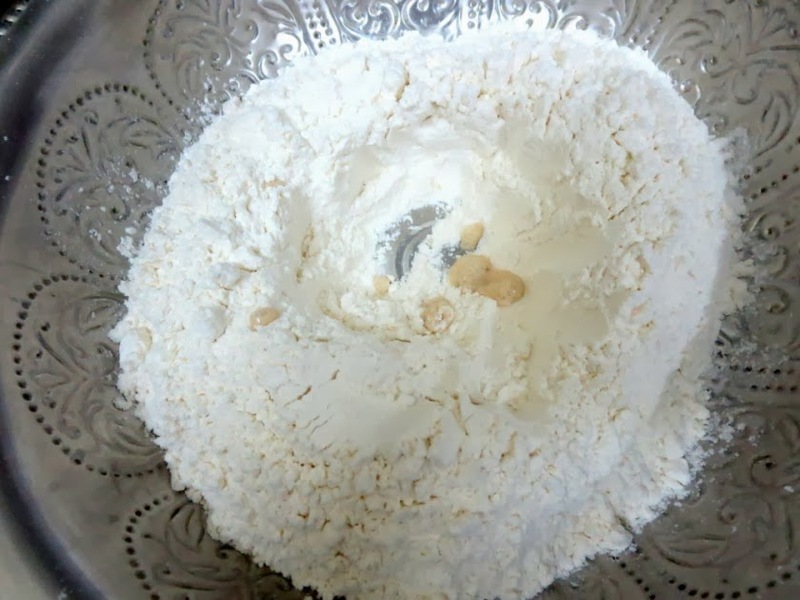 Roughly chop and coarsely pound the nuts together to make a powder. MW the water for 40 secs, take the yeast along with sugar in a bowl, add the lukewarm water and keep it covered for 10 mins. If the yeast is all active, you will find it frothed on the top. 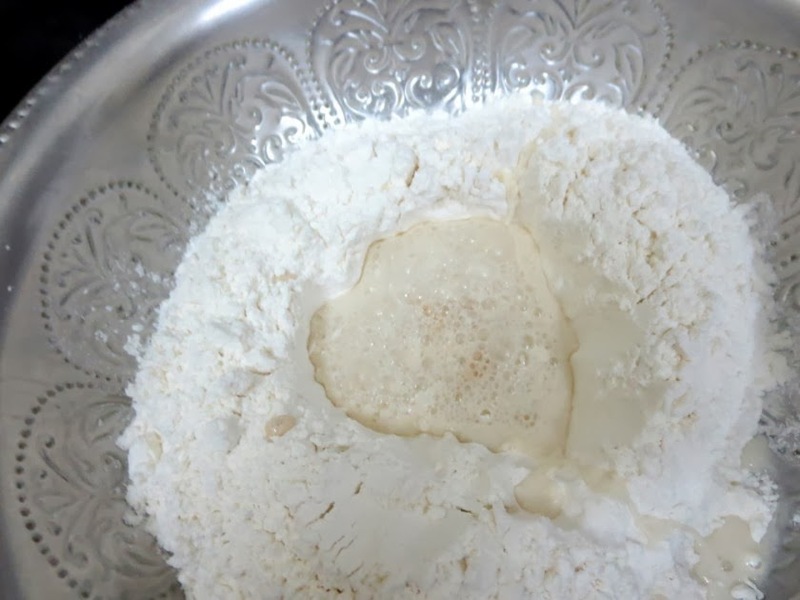 In a wide bowl, take the flour, salt and add the yeast. Mix well. Then slowly add water and knead to a soft pliable dough. Knead around for 10 mins, place it in a greased bowl, with lid covered for about 1 & 1/2 hrs to 2 hrs. Once the dough doubles it's size, punch down and knead again. Keep it covered for 30 mins. When you are ready to make naans, knead the dough and pinch out equal balls. Keep the rest covered. 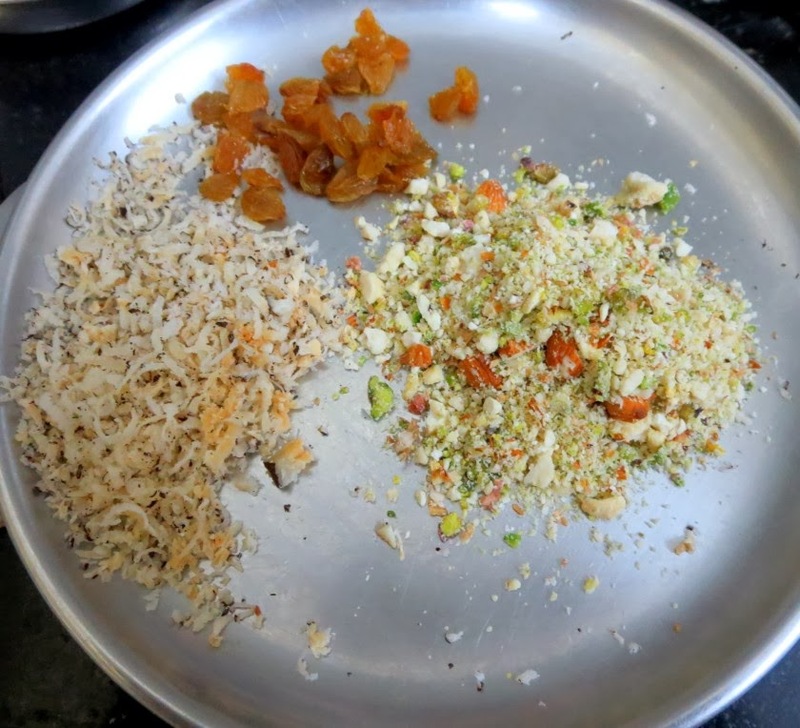 Dust the board and stuff a tsp of dry fruits into each ball. Flatten it well and make sure the filling is covered on all sides. Dust the balls and gently roll them into oval shapes. 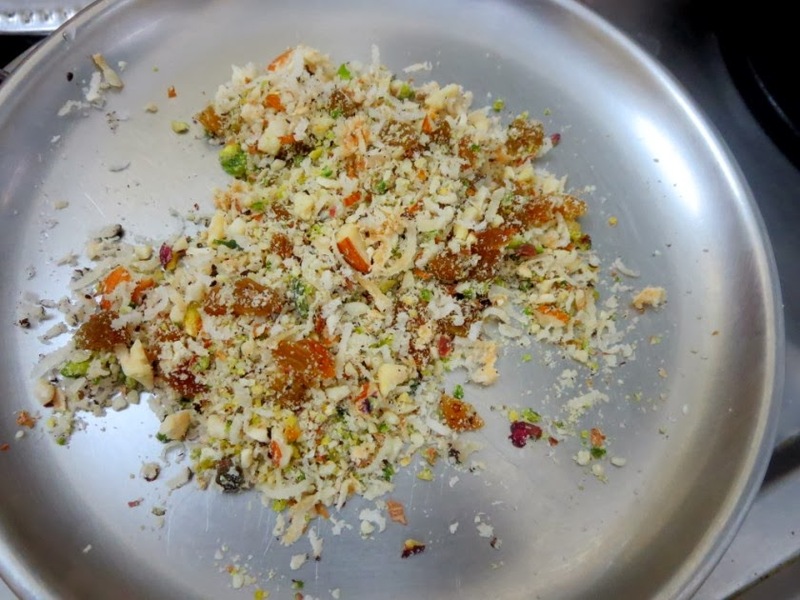 Press the almond slivers on top and brush with saffron soaked in milk. Place the naans in a baking tray and bake for 7 - 8 mins. Remove and brush with butter and again bake for 2 -3 mins. This is much simpler and quick. 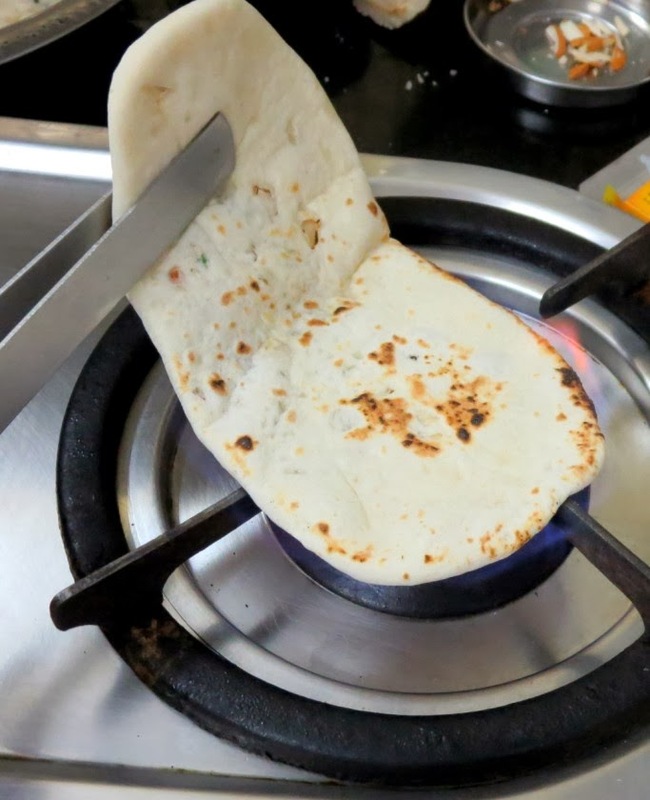 Heat a tawa and cook the naans lightly on both sides. Then with tongs, show these on directly flames on both sides. 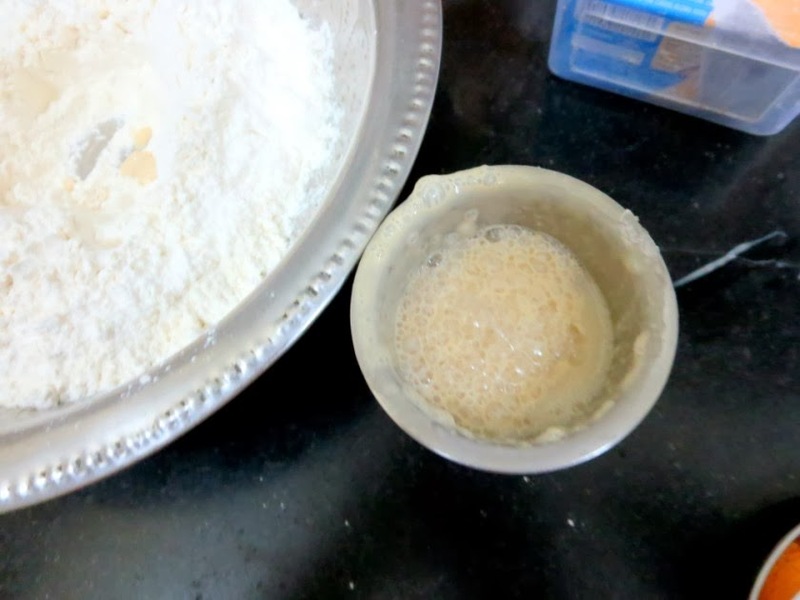 It takes about ¾ cup of water to knead after adding the yeast and water. Apply oil to your hands and continue kneading. 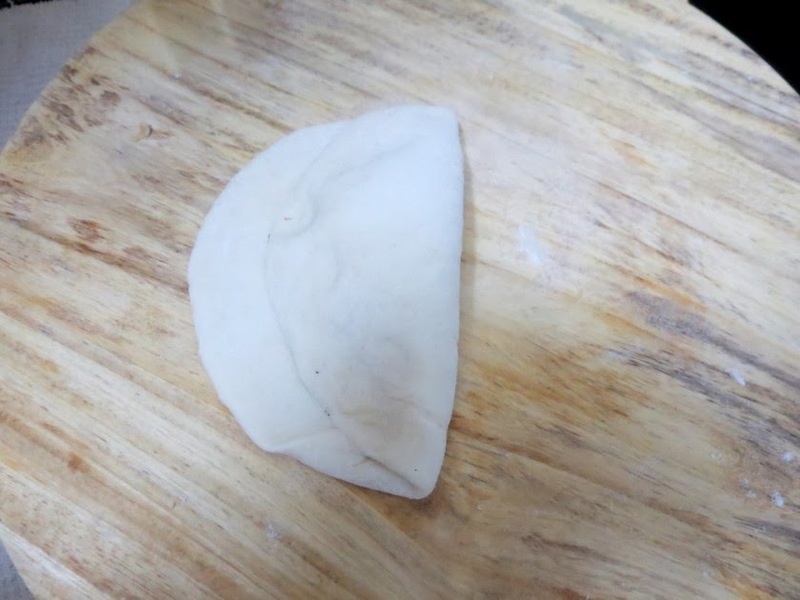 This way the dough incorporates the oil and becomes more soft. If you want to get the dough rise quickly, place it in a pre heated oven and let it stay warm for 10 mins. 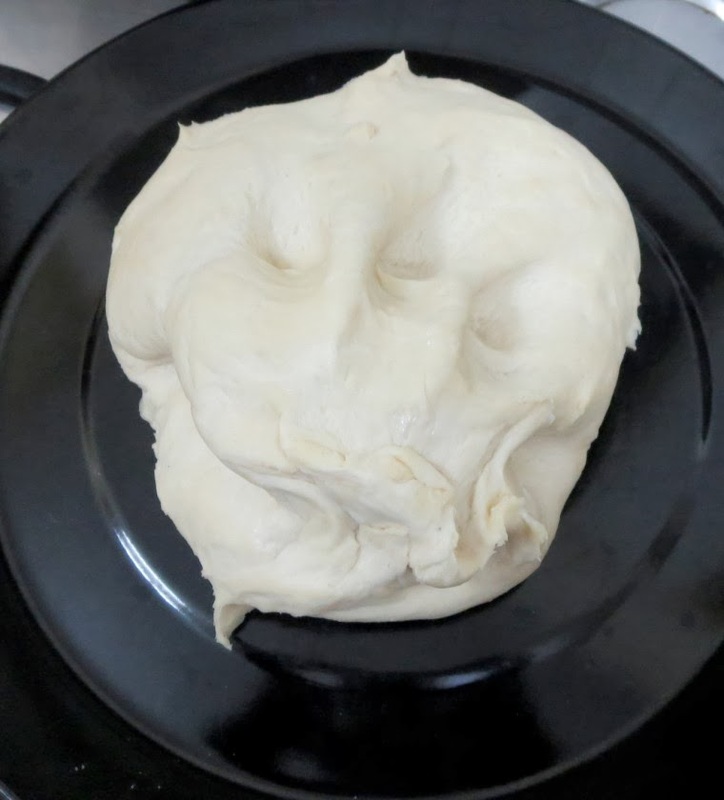 The dough rises up very quickly.